1 There are theoretical compositions that only involve theoretical sound, such as planetary motion viewed as waves. 2 Perception by the senses takes us back to the famous philosophical problem regarding whether a tree falling in a forest makes any sound. Traditionally, the answer is, "No," because 'sound' requires a hearer. This anthropocentric solution assumes that animals cannot hear, or that their hearing does not count. Of course, if there was just a forest fire and all the animals were gone...well, that would explain the tree falling too, I suppose. 3 In the early days of music synthesizers, only a few other simple waves were available, largely because they lent themselves to easy electronic production. They were the square wave , the triangle wave , and the sawtooth wave . Each of these wave forms has its own recognizable sound, and users of primitive synthesizers used to combine them to create others. In this graphic (which happens to be a sine wave), the push and pull of the air are represented by rising and falling areas on the wave (the center line is not part of the wave; it represents 0, the point at which the air pressure crosses over its initial state). The only way to produce a true sine wave is with a synthesizer, but a modern flute comes close. The amount of time it takes to complete one cycle is called frequency. In music, we know that as pitch (note value). The distance between the centerline and the highest or lowest point in the wave is called amplitude. We usually call it volume. Nevertheless, we buy amplifiers, because a volumizer is something you use on your hair. Both of these waves are from a rhythm electric guitar. The irregular bumps are overtones, other notes, or other instruments in the general mix of sound. When different waves are combined, we are lost making visual sense out of them (except for the occasional 0s), but our ears can hear and separate, say, the flute from the trombone in a duet. However, in order to continue this discussion with respect to harmony, it is better to go back to the sine wave, simply because it is much easier to see what is going on. Polyphony is the word for two different notes occurring at the same time. Harmony describes the constantly moving target of what types of polyphony 'sound good.' Since sounding good is entirely subjective, what one person regards as harmonious may well come off as dissonance (polyphony that sounds bad) to someone else, and this has certainly been true over time. Listeners in the 21st century don't even raise an eyebrow at some combinations that left 14th century listeners quite uncomfortable. The most basic harmony, with which even the ancients as far back as we can know were comfortable (so basic that most of us do not even think of it as polyphonic), is the octave. The octave is simply a doubling (or halving) of the frequency of a note. An octave higher vibrates twice as fast; an octave below does the opposite, vibrating half as fast. 4 The second image illustrates what happens when you sound the octave harmonic on a stringed instrument, where the first image represents that string played open; the vibrating length is divided in half, and so the frequency of vibration doubles. If you quarter the length of the string (fifth fret [=4th] harmonic-not illustrated), it sounds two octaves above the fundamental. You will keep getting higher octaves as you keep chopping the vibrating length in half. If you are actually doing harmonics, you create a node at the point where you touch the string, and the string itself creates a series of other nodes, so that the string itself is vibrating in a pattern that resembles the waves in the pictures. 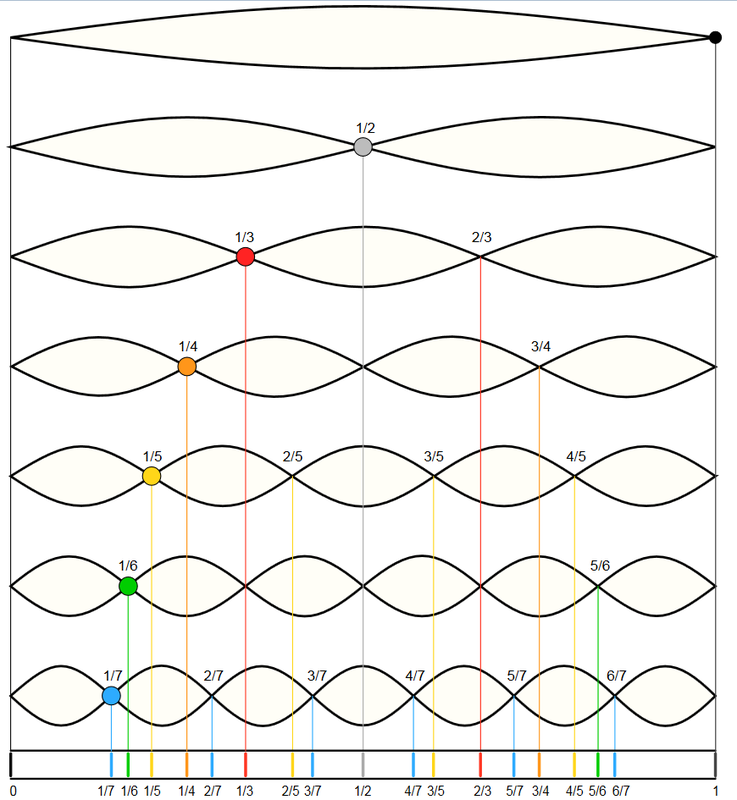 5 A Wikipedia article lists the harmonic series up to 20. Some have argued that the fourth appears in the harmonic series as the distance between the third and fourth harmonics. This same approach would allow us to find a minor third between 10th and 12th. Personally, I think the harmonic series only includes intervals from the root. Both, however, may sound fine to us simply because they are inversions of the fifth and major sixth respectively. In the 15th c. the fourth was heard as a dissonance (Johannes Tinctoris in Terminorum musicae diffinitorium, 1473), although it had been perceived as consonant previously during the middle ages. Modern Western listeners go both ways, hearing it as consonant when internal to a chord, but dissonant when exposed: Exposed on top, it seeks to resolve to the third; on the bottom, it destabilizes a chord, and usually resolves with the fourth becoming the root of the next chord. You will no longer perceive this as a version of the same note. In fact it is a fifth higher (if the lower note were a C, this would be a G). 1/3 is an octave + a fifth up. 1/5 is two octaves and a third up. 1/6 is two octaves and a fifth up. 1/7 is two octaves and a dominant seventh up (audibly flat). 1/9 is three octaves and a second up. If you have been practicing your scales, you may notice that this does not really correspond to what westerners consider normal (the major diatonic scale). There is no dominant seventh in our western major scale, and we make much use of the fourth and the minor third, which are notably absent.5 But western practice is partly molded by cultural expectation, as with all the different ethnic expressions of music in the world. If the dominant seventh (b♭ in the chd>C scale) or the second (d in C) sound mildly dissonant to you, try moving them up a couple of octaves and see if that helps (leave the fundamental where it was). Not everyone agrees that these fundamental harmonies are neurologically perceived, and so built into the human experience. Although evidence from neurology (Tramo, et al, 2001), musical perception in babies Trainor, et al., 2002) and cross cultural similarities worldwide although some world music seems quite different), do suggest that there are fundamental features of harmony. There is also evidence that we share a common perception of dissonance (Cousineau, et al., 2012). In addition, on most instruments, the note sounded actually includes the other notes listed above, although much more quietly than the fundamental, and varying in relative strength from instrument to instrument. The existence of these overtones within sounded notes may not be audible to our conscious minds, but our ears and our brains hear them, which may reinforce our tendency to perceive those notes as harmonious when we hear them separated out. 6 Preference for extremely dissonant music may also be a psychological reaction to, or expression of, loss of center in the modern Westerner's self-image. However, in real life, where our natural responses are reshaped by culture, we may come to perceive some things as appealing which push the perception of beauty beyond natural consonance. Modern westerners prefer many musical combinations that would have sounded dissonant to people in our own culture in the not so distant past. Western music has consistently 'pushed the edge'-partly as composers look for new sounds, and partly as we reach a level of boredom with the same old thing.6 At the same time, many of us in the West are still uncomfortable with much Middle-Eastern, North-Indian, and far-East Asian music, because they push perceived consonance into areas to which we have not yet become accustomed. Often what sounds strange about these foreign-to-us expressions of music represents the same kinds of edge-pushing we see in the modern West. They are wanderings from the expected natural harmonies which listeners in those cultures have come to expect and enjoy. At some point, as dissonant notes approach each other, our brain no longer hears them as different notes. At first they just sound out of tune, and then the approaching notes come together. Different people perceive this unity at different times, but a trained listener can hear when notes are almost, but not quite there. When that happens we perceive that as 'beats' in otherwise harmonious notes. This is what you get when the notes are so close that their coming in and out of phase with each other is actually audible-a sort of tremolo in the note. As the notes get closer, the 'beat' gets slower, until if finally disappears. Many people can hear these beats even between different notes, especially with fifths and thirds. It is listening to, and timing, those beats that allowed people to develop the equal tempered scale which is the standard for modern Western music (next section). 7 There are other ways of describing his comma, which I am not going to burden the reader with, in hopes that she may be able to stay awake just a little longer. Just when Pythagoras thought he had it all worked out, he tried to continue the overtone series around in a circle. Theoretically, when you take the fifth of a fifth of a fifth of a fifth... etc., until you have gone all the way around twelve notes, you should be back where you started. More specifically, 12 perfect fifths should get you to the seventh octave. He discovered that this was not the case. When you get done, you are about a quarter of a tone off. This difference is called the Pythagorean Comma.7 It is one reason why your guitar never seems to be quite in tune. This may be when he decided to go back to good old predictable triangles, but, truth be told, it wasn't that big a deal—the instruments they had available didn't cover seven octaves anyway. However, by Bach's day, this was no longer the case, and to complicate things further, composers wanted to be able to change keys all the time. You could get the clavier tuned for one key, but then it was all wrong for the next. This was exacerbated by the fact that the 'perfect third' in the overtone series was even harder than the perfect fifth on the key change problem (or even just changing chords within any given key). 8 Two cents = two hundredth of a semitone. Since the notes are obtained logarithmically, this does not correspond to a specific change in Hertz. 9 This statement depends on how you define "straight." It is a logarithm, so the actual calculation to get the next note in the series is the frequency of the current note times the twelfth root of two (f1 = f0 * 21/12). If you regard this as straight math, well then, there you have it! 10 Adopted by ANSI (the American National Standards Institute) in 1936, and ISO (the International Organization for Standardization) in 1955. The solution that the musical community arrived at in the 17th century (which still holds for today) was to fudge the tuning a little. Nowadays, a piano tuner will tune all the fifths just a hair flat8—close enough that most of us wouldn't notice. This results in a straight mathematical division of the octave into 12 semitones,9 by means of which she can make the instrument go around the circle of fifths and end up back where it started, and you can play the piano in any key you want. This solution is called the equal tempered scale. Other instrument makers followed suit. The third is also a little off in this system, but again, not so you notice, unless you have a very good ear; but if you actually tune a note to what sounds like a good third, you are likely to be out of tune the minute you change chords. Related to the issue of relative tuning is the question of standard pitch. By tradition the oboe sets the standard pitch for an orchestra by playing A above middle C, and then everyone else tunes to that note. But what exact pitch that is has varied over time, and still does from place to place. In the US and Great Brittan it has been standardized at 440 Hz10 (Hertz—a measure of frequency that equals cycles [e.g. complete waves] per second). On the Continent, it is often two or three Hz higher. Over the last five centuries it has ranged between 400 Hz and 480 Hz. There is a movement afoot to re-standardize it at 432 Hz. The difference is hard to hear, and the reasons given are usually semi-religious, having to do with natural rhythms and ratios found in the universe, but many people simply claim it has a more natural sound. Those same people will also sometimes push for a return to Pythagorean tuning (based on overtones, rather than a mathematical division of the octave). It is true that the natural thirds and fifths sound a little sweeter, as long as you stay on one key and don't use chords. This is not a plug, just an observation. 11 There are, of course, similar music theories underpinning other world expressions of music, but not much of that is likely to come up here. That pretty much hits the physics of harmony issues that are useful for this series. 'Music Theory' usually refers to the theoretical underpinning of common practice in the West.11 The issues I have discussed here are rarely of more than academic interest to actual practitioners of music (either composers or performers), and certainly not to listeners. This is, to some extent, why I have left it to last. However, if you are like me, by now you have built up some curiosity. Cousineau, Marion, Josh McDermott, & Isabelle Peretza (2012). The basis of musical consonance as revealed by congenital amusia. Proceedings of the National Academy of Sciences of the United States of America. Landman, Y. (n.d.). Overtone series illustration used in the Wikipedia article, "Musical Acoustics." Seeger, Charles. 1975 . "Toward a Unitary Field Theory for Musicology." In Studies in Musicology, 102-138. Berkeley: University of California Press. Tramo MJ, PA Cariani, B Delgutte, & LD Braida (2001). Neurobiological foundations for the theory of harmony in western tonal music. Annals of the New York Academy of Science, 2001 Jun;930:92-116. Trainor, Laurel, Christine Tsang, & Vivian Cheung (2002). Preference for sensory consonance in 2- and 4- month-old infants. Music Perception: An Interdisciplinary Journal, Vol. 20, No. 2 (Winter 2002), pp. 187-194. Wikipedia. Harmonic series (music). Accessed 3/2013.